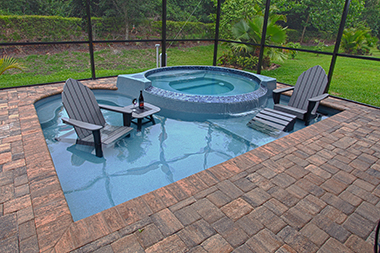 The Fun Deck is a totally different type of fiberglass spa that we offer. It is much different from any other spa model because this spa comes with an attached Splash Pad (fun for all ages). Therefore, you can enjoy our Fun Deck for cooling off in the heat of the summer or warming up in the chill of the winter. The choice is yours! San Juan Pools welcomes you to our unique and radically different Fun Deck! 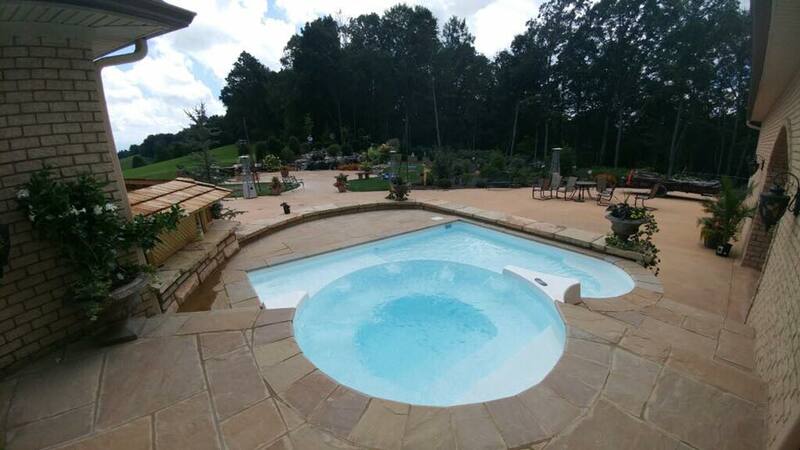 This fiberglass spa model is entirely in its own category of fiberglass pools and spas. In fact, we’ve designed the Fun Deck for one purpose: to be a hub for fun and relaxation. Summed up in one complete sentence: the fun deck is meant to relax you and entertain you. Just how can we accomplish this in a 14′ x 16′ footprint? For starters, the Fun Deck includes a raised spa with a nearly 7′ diameter spa. 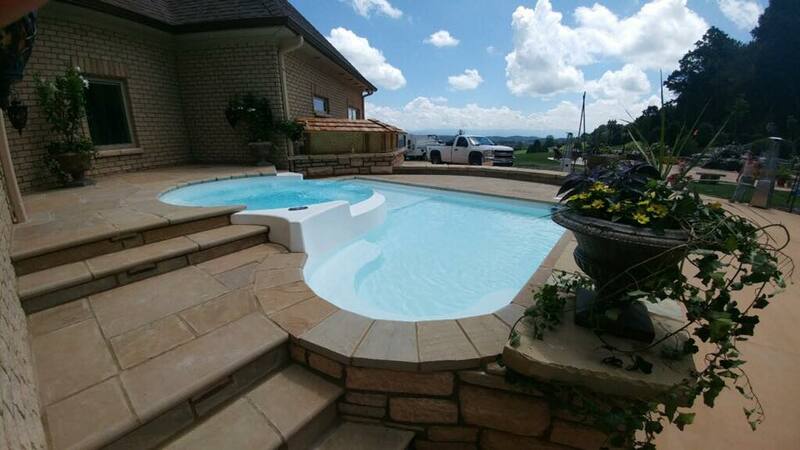 This spa is perfect for holding 2-3 swimmers and is a great space for entertaining and relaxing outdoors. Transitioning from the Fun Deck’s raised spa, we’ve also included a 1′ 6″ Splash Pad at the lower level of this entertainment model. This splash pad is perfect for situating some pool furniture, playing with young swimmers or attaching some water features. The choices are wide and varying depending on the abilities you want your Fun Deck to have! As we’ve just mentioned, the Fun Deck is meant to be both a space for fun and relaxation. We recommend purchasing the Fun Deck as your primary spa (for small backyards) or as an add-on for another San Juan fiberglass pool model. In any case, this is a great entertainment piece that is sure to provide hours of relaxation and play for the whole family. It’s important to emphasize that the Fun Deck includes two different depths: for the spa and splash pad. For starters, the Spa includes a 2′ 4″ depth while the splash pad only reaches 1′ 6″. This is a minor detail but still important to note. If you’re a home owner looking to expand your outdoor entertainment options or a commercial apartment complex – the Fun Deck can be the perfect compliment for your next outdoor recreation zone. Regardless of what type of residence you own or manage, we’re all looking to do the same thing outdoors in the summer: cool off, have fun and relax. Therefore, why not provide all of the options to your home or client base? In conclusion, the Fun Deck is the perfect addition to any home or apartment complex that is looking to spruce up its recreational space. This fun-packed fiberglass spa includes a 1′ 6″ splash pad and a raised radius spa. 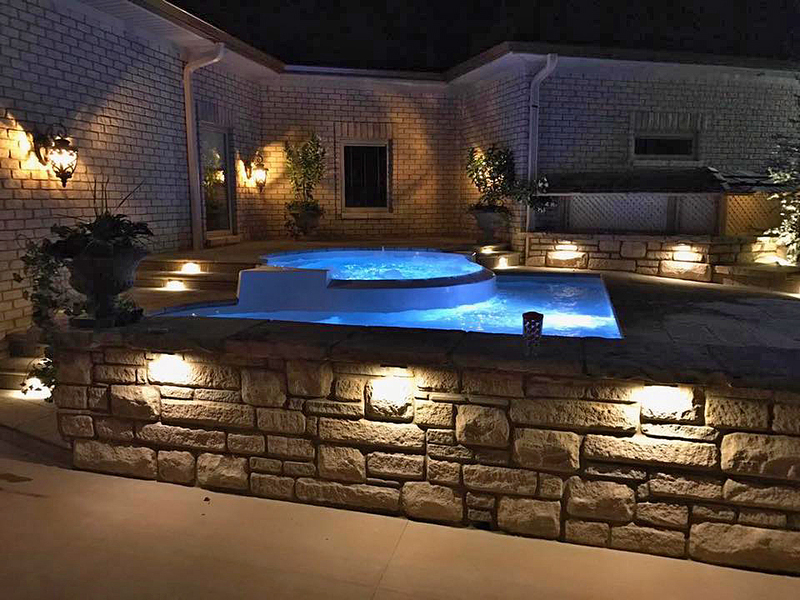 It’s a great choice for anyone that is looking to purchase a primary outdoor entertainment hub, or add onto an existing pool or new pool purchase. We recommend the Fun Deck for all of our San Juan clients and are excited to announce it as part of our fiberglass spa lineup!